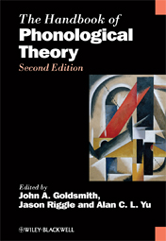 Editor/Author Goldsmith, John A., Riggle, Jason and Yu, Alan C. L.
The Handbook of Phonological Theory, is an innovative and detailed examination of recent developments in phonology. Revised from the ground up, the book is comprised almost entirely of newly-written and previously unpublished chapters. Offers new and unique contributions reflecting the advances in phonological theory since publication of the first edition in 1995. Addresses the important questions in the field including learnability, phonological interfaces, tone, and variation, and assesses the findings and accomplishments in these domains.